Located in the downtown corridor, Davis Gallery & Framing serves as Austin's fine art and framing destination, showcasing contemporary and traditional art from both emerging and mid-career artists. As our show “Reordered” comes to a close this week, I was able for the first time to take a breath and look closely at the carefully crafted work of Lisa Beaman and Randall Reid. Lisa’s work often features figures, animals, plants, and focuses more clearly on narratives. Randall’s work is often more minimal, with details including numbers, one or two words, but primarily focuses on color and line. While walking through the show, time and time again I caught myself thinking about my childhood, my friends, and how freely my imagination once roamed. Randall Reid’s image titled “Off White” reminded me instantly of my father. In this piece, Randall uses re-salvaged wood, simply composed inside his trademark metal frames. I imagined myself working together with my dad on a walkway we made together that wraps around my house. I can still feel the gnats that came out at dusk, mercilessly biting at us while we finished the project in mid-summer. For me, these moments make Lisa and Randall’s work great. Davis Gallery is kicking off our Fall 2014 season with “Face Value“, an exhibition that explores how we perceive faces, and interpret personal identity for ourselves and others. This show will include traditional portrait photography, collage, and elemental images. We are immensely proud to show the work of Leon Alesi, Scott David Gordon, Lesley Nowlin, and Jamie Panzer. Lesley Nowlin is a photographer and conceptual artist based in Austin, TX. She began photographing in her teenage years. She received her Bachelor of Arts degree from the University of Hartford. Her work focuses on posed subjects and creating a narrative world from her imagination. My dad photographed a lot when I was growing up. When I was about 13 or 14, I remember him showing me how to meter light on a Leica Rangefinder in the backyard. Who or what has had a major impact on your career? My parents and my twin sister. Describe a typical day in the studio. First, I come up with my concept for the specific shoot. I schedule it with the twins and hair/makeup stylists. Shoot usually takes 3-4 hours, all shot digitally with Canon 5D Mark II. Go home and select through 400-500 images. Usually edit 5-10 that I love. Then I hone in on 1-2 that are the best for my project. Visually edit the image with high contrast, cut the image (in Photoshop) into separate images for be printed individually. Most full pieces in this series are longest side 10-30 inches. Turn image into a visual negative (can take a while). Print negatives. Go to darkroom and start printing platinum, line the vellum with composition leaf, flatten the prints between many processes. Varnish, cut, adhere together. Final varnish. Take to framer. All of this can take up to a month to complete. Tell us a bit about your new work in Face Value. These pieces are an elemental reflection of the struggle and comfort you can find in being a twin. Throughout the years, growing up with someone by your side and having a partner since the womb can be a comforting and struggling experience. I’m hoping to show the angst of wanting to be different than your twin, and the natural calmness you feel of knowing your partner twin will always be there with you. You don’t have to open your eyes to know their presence is there. Twins have to learn partnership at a very early age. If you weren’t an artist, what would you be? A soccer coach or investigator. When (if ever) do you feel like a piece is finished? Usually when it’s framed and I can’t touch it again. I have to be good with it by then. Single best invention in your opinion. What item would you be lost without? And now for the most important question: Who would you say has the best margarita in town? Hmm… hardest question! Maybe La Condesa? I should ask my husband, he drinks more margaritas than me! Face Value opens September 6, reception from 7-9pm at Davis Gallery. The show runs through October 18. Check back for more interviews with other artists in the show! We love studio visits! 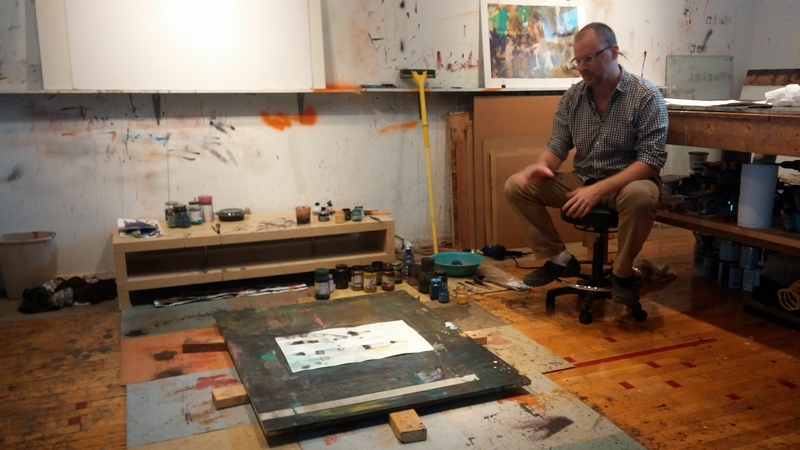 Earlier this week, we took a road trip out to Lockhart to visit Christopher St Leger in his charming, paint- spattered studio. My first start at getting started went on and then off almost seasonally (in my twenties). But the beginning of what it is now, which is to say an occupation that I practice or think about daily, happened most of all when I’d resigned myself from advancement thru formal education. It was hard to make this decision. Who or what has had a major impact on your career as an artist? Process has had the biggest impact. I latched onto individual paintings and worked through their content and method for years. I have had a postcard from an exhibition of watercolors by Ian Potts on my desk since 1997. This mixed with deviating for periods of time by working with abandon. Watercolor is a special beast that is less concept-based and more practice-based which is why it’s usually referred to as a “tradition”. The focus is heavy on borrowed or inherited technique, sharing tricks such as scraping the paper with an x-acto knife for snow effect. Just go to the library and count all the how-to books. 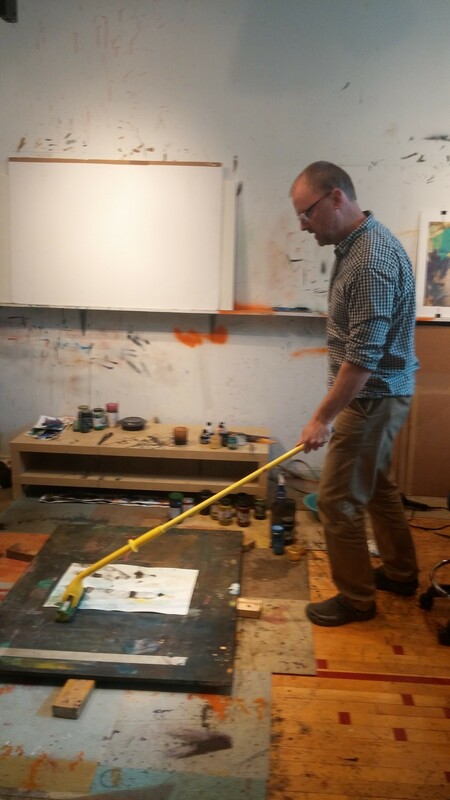 Some folks I have managed to acquaint myself with personally have also had impacts: David Leonard, Jan Heaton, Lance Letscher, Leon Alesi, visual artists working in various media who are based around Austin, all have unique success strategies and tips (though nothing on how to create wispy snow in watercolor). I like to leave a painting unfinished so that when I return the following day I can pick right up. And though the whole thing is kind of a flowing experience, in recent cityscape work there are tedious parts of the painting that require planning. 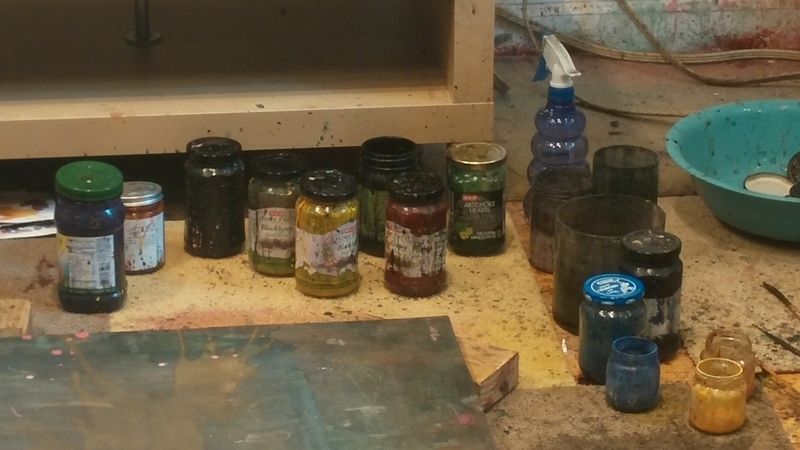 The playful parts that my 7 yr old son says look “easy” usually involve pouring and glazing. These are indeed fun but can also be the most intense. Creating atmosphere with edge to edge pours of permanent ink requires my attention at its fullest. If I make it look easy this is ok, but internally it’s when I don’t answer the phone or remember much of the conversation if I do. I can’t stop in the middle of this. So, the day is spent mostly between planning and pouring. Too many things. Most available temptation, however, would be to insert myself gently into the rosy field of architecture. A stable and calm work environment, congenial team members, socially responsive housing projects, … Or a classical musician, with the same fuzziness. When (if ever) do you feel that a piece is finished? I used to think that you can’t really overwork watercolor. Lately, I’ve pushed this a bit. But you just know. Most important question: Who would you say has the best margarita in town? Thanks for having us Chris! Welcome to the official blog of Davis Gallery Austin. Here you will find updates from the trenches, exhibition information, artist information, and updates on the art market in Austin, in Texas, and beyond. 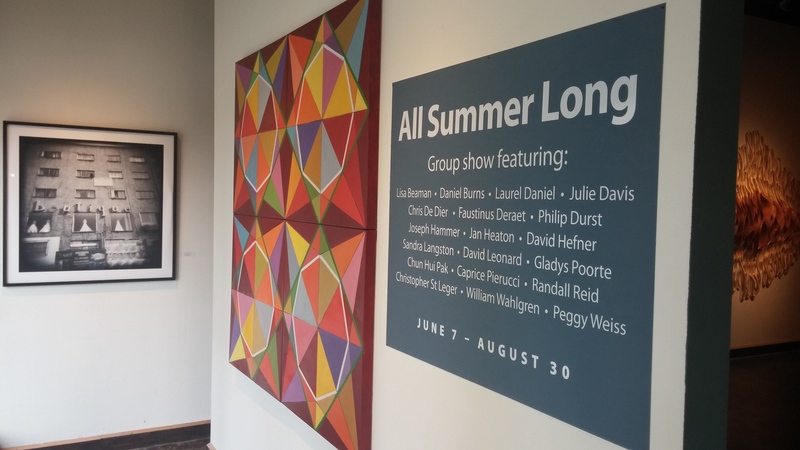 Our summer group show has been in full swing for a month now, and we’ve had fun showing off the beautiful and innovative work by our gallery artists. 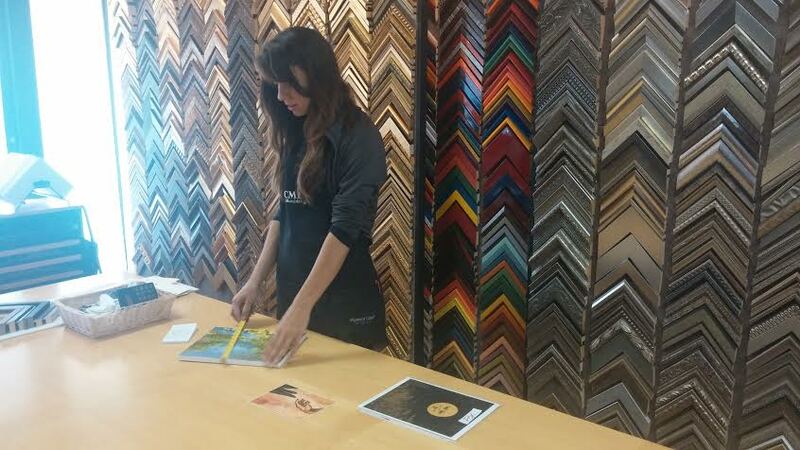 One of our framers, Jenny Jenkins preparing a piece for framing. 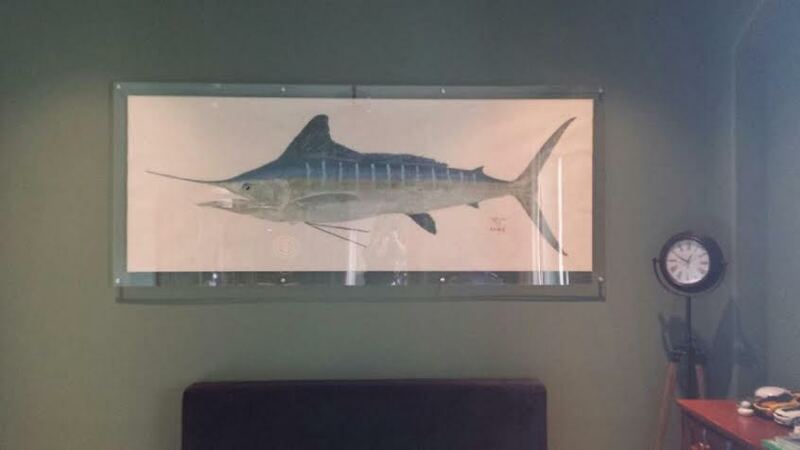 This marlin was installed in a client’s home after being framed in a plexiglass box. Give us a call to find out more about installation rates and availability!